When the Khmer Rouge took over Cambodia in 1975, Chomsky and the New Left welcomed it. And when news emerged of the extraordinary evacuation of the capital Phnom Penh, accompanied by reports of widespread killings, Chomsky offered a rationalisation similar to those he had earlier provided for China and Vietnam: there might have been some violence, but this was understandable under conditions of regime change and socialist revolution. In 1977 he commended a book about the Pol Pot regime for "giving a very favourable picture of their programs and policies". By this time, however, there were other reports that took a different line, accusing Pol Pot of genocide. Chomsky mocked their case and picked at their sources, revealing that a famous photograph of forced labour in the Cambodian countryside was a fake. He acknowledged that Cambodian refugees gave "a grisly account [of] the barbarity of their treatment at the hands of the Khmer Rouge", but said we should be wary of the "extreme unreliability" of these reports. "Refugees are frightened and defenceless, at the mercy of alien forces," he said. "They naturally tend to report what they believe their interlocutors wish to hear." As late as 1980, Chomsky explained Cambodian violence largely as a product of the failure of the 1976 rice crop. "The evacuation of Phnom Penh, widely denounced at the time and since for its undoubted brutality," he wrote, "may actually have saved many lives." But the progs in the Dead Kennedys were awake to Pol Pot's genocide in their song "Holiday in Cambodia": lyrics. There will be a song inspired by your brilliance, Rooster...watch for it on the Peoples' Karaoke. Comrades, I just received my souvenirs of the glorious Pol Pot regime, just in time for Halloween. 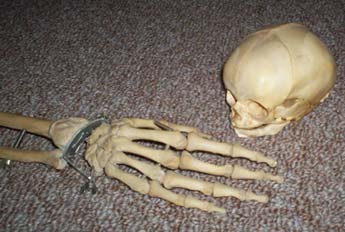 Here we see the skull of an infant thought criminal along with the very hand that nursed it. A chill warning to all who now oppose Obama's progressive policies. Execution of infants was occasionally carried out by swinging their heads against a tree. This is an outrage against Gaia! Someone must have failed in the Khmer translation. Indeed comrade. My infant skull is very delicate, hardly thicker than parchment. You'd think that simply stomping on it with the heel of jackboot would suffice. No need to abuse a poor humble tree. Perhaps the trees in Kampuchea were guilty of some thought crime as well. In which case, you'd be killing two birds with one stone. That is very effective reasoning. I must make note of it. Baby skulls are only worth 50 points, if you really want to earn some real Poll Pot Rubles, bring me the skull of a reactionary thoughtcriminal like Michael Moore who's professed love for Kapitalism is nary enough to keep the Lord Obama in power for life. No Comrades, we need a real Revolutionary(TM) propaganda film artist like Sergei Eisenstein! General Mousey-Tongue, Where is this glorious song you promised, I want to sing it with all the chillin'! You couldn't of timed it any better for the Non-special-equal-to-all holiday of Halloween! I know this was just said by comrade Whoopie, but I know a perfect place to put said skulls in my place of residence. WOW!!! Look at ALL THOSE ACORN VOTERS!!! Yet another glorious byproduct of Progressive Obamacare and Comrade Ezekiel Emanual's "Complete Lives System"...once a Re-Thuglikan 'unperson' has lived the full measure of his/her worthless life...we can vaporize them into a Left-Minded Progressive (such as the ones pictured above) who will be made available for ACORN registration and Voting Drives. We can have the Comrade New Black Panthers check for Re-Thuglikan ThoughtCriminals at the polling booths. They can then be guided around back. There will be little need for the wasteful spending of re-education...one half-priced little Blue Pill(TM) will be all that is required and then they may vote as Necro-proxies for the Party! ....and that's not all! Each "Instantly Reformed ThoughCriminal" also is useful for labor on the People's Farms as Organic Compost Specialists! Indeed! Perhaps we should name this the "Complete Circles of Life System." I am deeply humbled at the adulation shown by the Progressives at my life's work. Hopefully the service rendered to the Party has been sufficiently immortalized that when the time comes, our Dear Leader will lead the charge in repeating history he has not read. (That's what his professor-advisers are for.) If not, I may have to return from the grave myself, because when I say heads are gonna roll...well, look it up. Progressive Halloween!